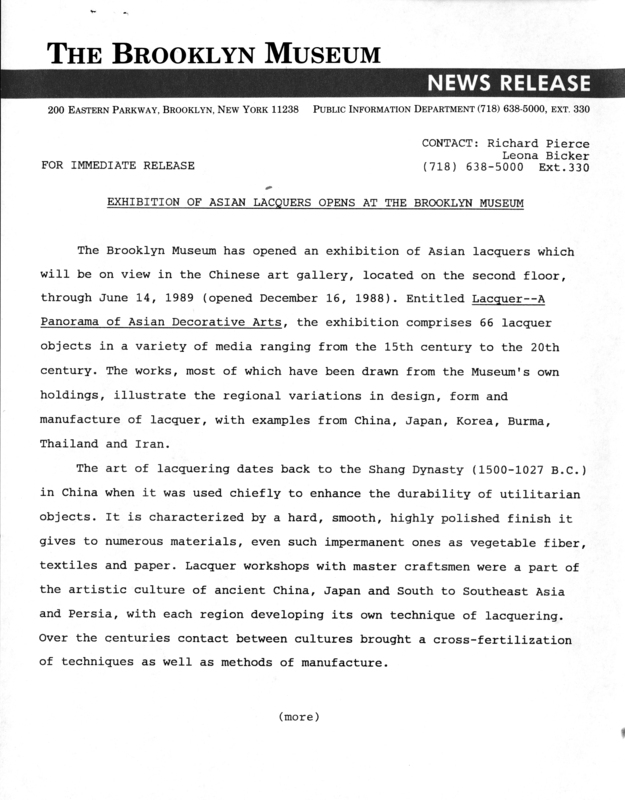 December 1, 1988 The Brooklyn Museum has opened an exhibition of Asian lacquers which will be on view in the Chinese art gallery, located on the second floor, through June 14, 1989 (opened December 16, 1988). Entitled Lacquer--A Panorama of Asian Decorative Arts, the exhibition comprises 66 lacquer objects in a variety of media ranging from the 15th century to the 20th century. The works, most of which have been drawn from the Museum’s own holdings, illustrate the regional variations in design, form and manufacture of lacquer, with examples from China, Japan, Korea, Burma, Thailand and Iran. The art of lacquering dates back to the Shang Dynasty (1500-1027 B.C.) in China when it was used chiefly to enhance the durability of utilitarian objects. It is characterized by a hard, smooth, highly polished finish it gives to numerous materials, even such impermanent ones as vegetable fiber, textiles and paper. Lacquer workshops with master craftsmen were a part of the artistic culture of ancient China, Japan and South to Southeast Asia and Persia, with each region developing its own technique of lacquering. Over the centuries contact between cultures brought a cross-fertilization of techniques as well as methods of manufacture. For the first time in any exhibition of Asian lacquers, East Asian, South Asian and Persian lacquers are shown as part of a homogeneous tradition. The Museum’s holdings, which have been acquired over a period from 1909/10 to the present, focus on carved cinnabar lacquers and inlaid lacquers from China, Negoro and maki-e (sprinkled-in design) lacquers from Japan, raden (inlaid mother-of-pearl) lacquers from Korea and one of the most outstanding collections of painted lacquers from Iran. Highlights of the exhibition include a carved cinnabar lacquer dish in the shape of a plum blossom from China (15th century, Yung Lo era, Ming Dynasty); a rare hollow dry-lacquer Buddha image from Burma (17th century); a lacquer on papier-mâché pen box from Iran (Safavid Period, dated 1718); a lacquer on papier-mâché, silvered glass and leather mirror case, also from Iran (1845); and a Negoro lacquer wine bottle from Japan (Muromachi Period, 15th century). Also noteworthy are two works by the contemporary Korean lacquer artist Donghwa Hong (b.1945), whose lacquer objects combine the traditional Korean lacquering method of mother-of-pearl inlay with innovative woven and lacquer hemp construction. The exhibition has been made possible by a generous grant from the J. Aron Charitable Foundation. The exhibition was coordinated by Amy G. Poster, Associate Curator and Acting Head of the Museum’s Asian Art Department, with assistance from Maryam Ekhtiar, Assistant Curator of Islamic Art, and Usha Ramamrutham, Research Associate. Brooklyn Museum Archives. Records of the Department of Public Information. Press releases, 1971 - 1988. 1988, 108-109.